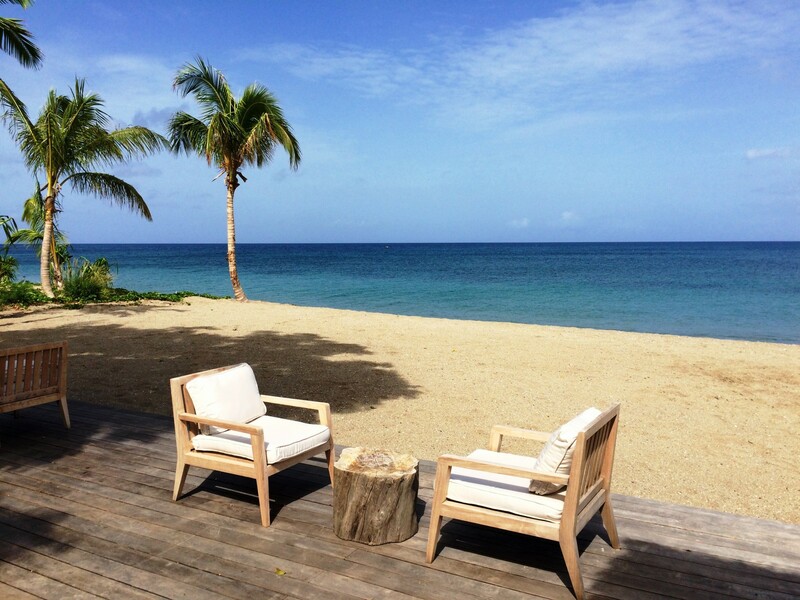 Welcome to our 4-bedroom ocean-view villa located on the beautiful Pinney’s beach in Nevis. 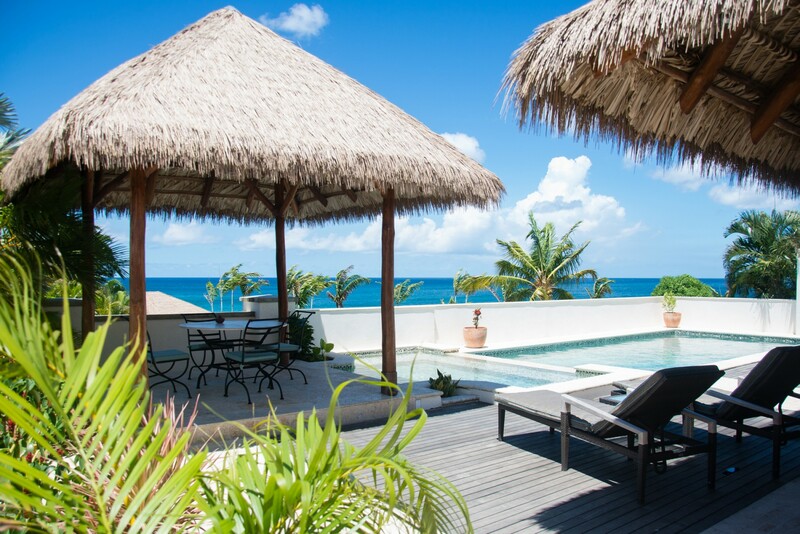 This is one of just seven very luxurious five-star properties each with either a private swimming pool or lap pool. The views from here are amazing as you have the Caribbean ocean in front of you and Nevis Mountain behind. 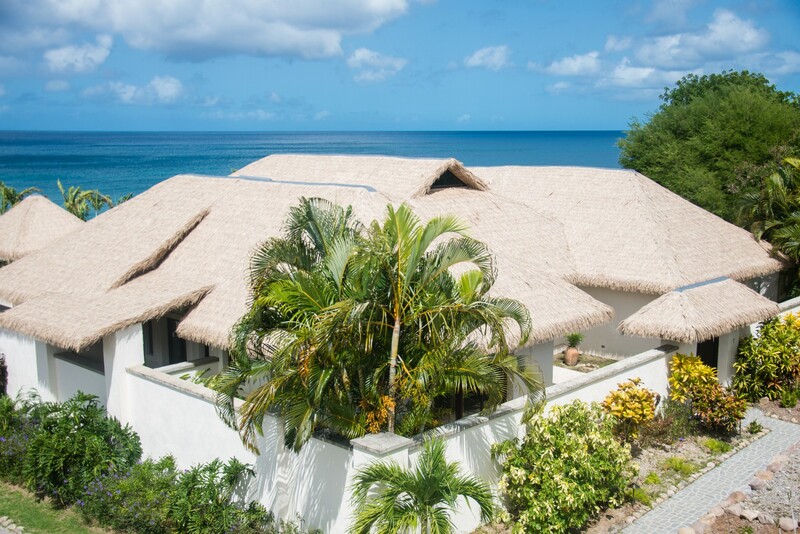 This four bedroom villa which is a short stroll from the beach has a raised elevation to capture the best views and is surrounded by lush tropical gardens to offer the maximum privacy possible. The ground floor features a large living area with sliding doors that open right up onto the private pool area offering you indoor/outdoor living at its best. 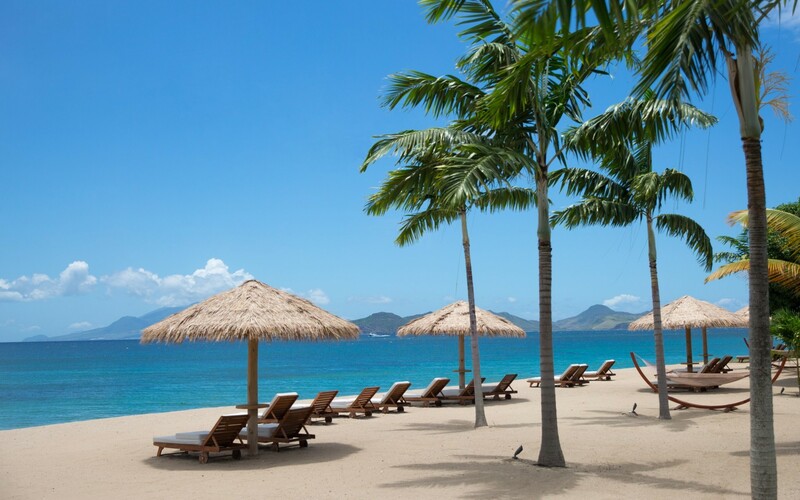 Here you will be able to enjoy the wonderful scents of tropical flowers and the fresh island breezes. 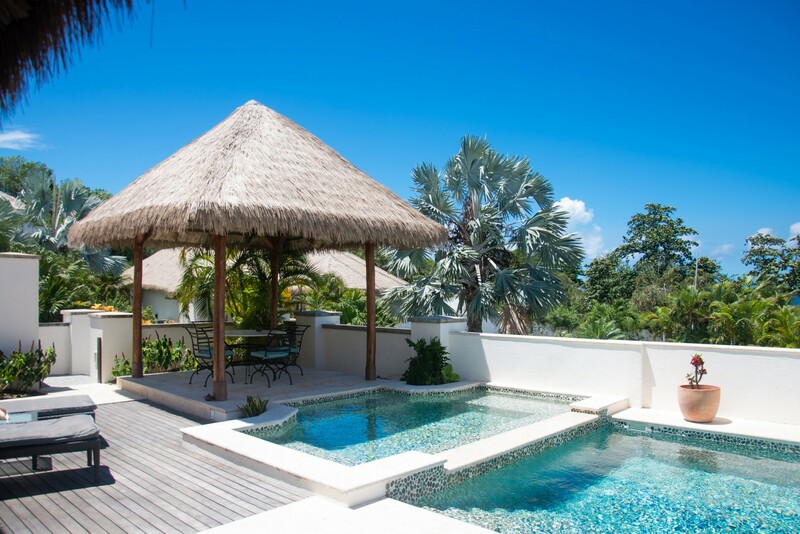 The pool deck includes a charming thatched Cabana for outdoor dining and a private plunge pool. 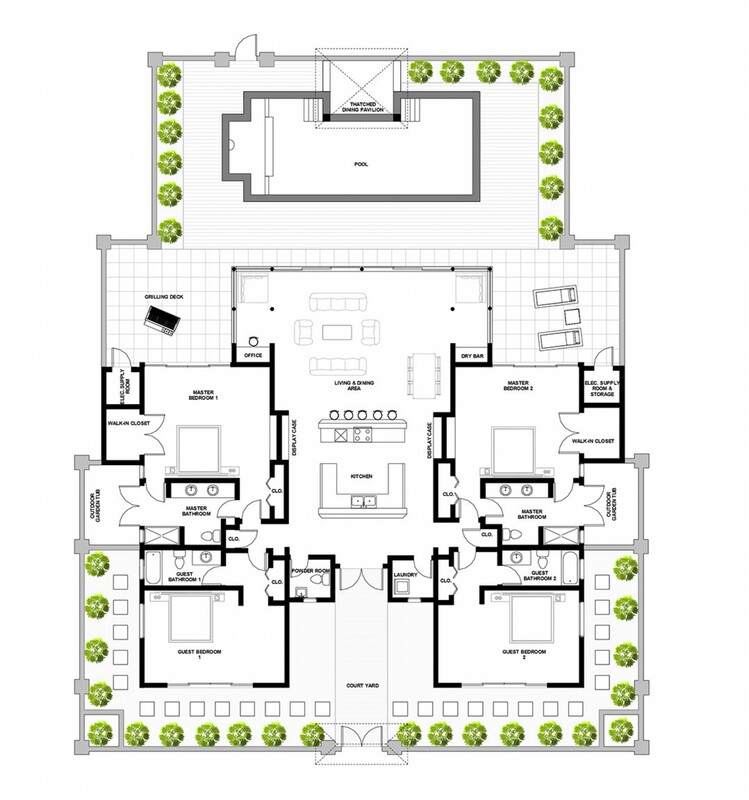 The 4-Bedroom Villas comprises of two master rooms both located on either side of the living area. Each of the master bedrooms has a private glass shower and ceramic tub, which opens to a spacious outdoor marble shower room for bathing in complete privacy while enjoying the gorgeous views. The two guest bedrooms are located overlooking the gardens. Each queen room has a marble tiled bath and glass shower en-suite. The Balinese glass doors open wide to a lush exotic garden to enjoy the occasional afternoon tropical rain, a charming island monkey sighting or the delightful hummingbirds! 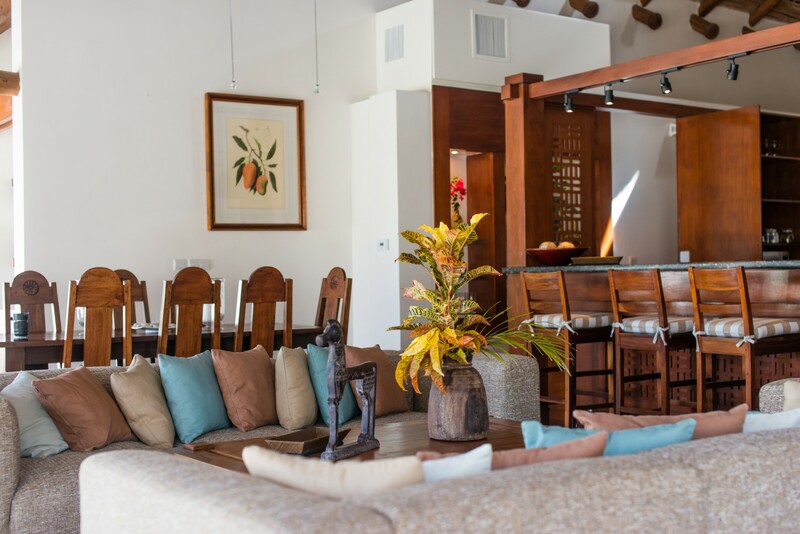 The interiors of this stunning villa have a unique and eclectic mix of the Caribbean and Asian furnishings and wood. 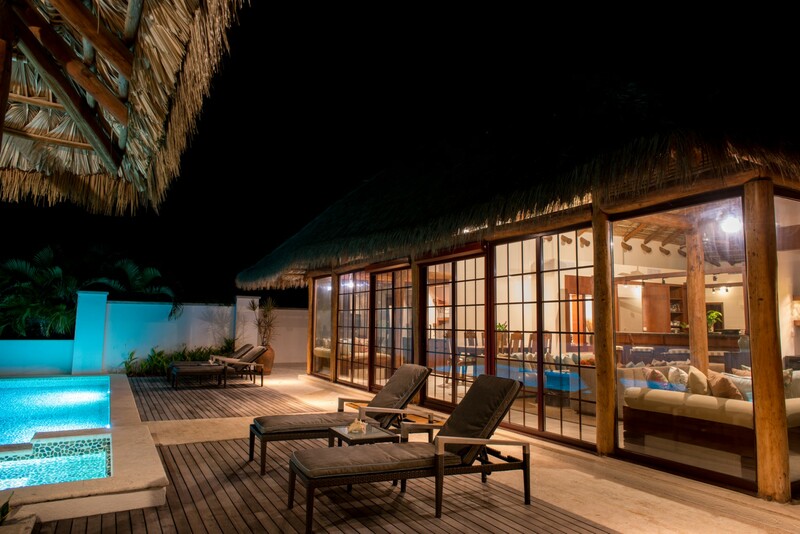 It has an Indonesian thatched roof; hand cut exposed beams and a 30-foot vaulted ceiling. The 5-Star amenities include super comfortable mattress toppers and pillows made of a lush hypoallergenic synthetic down fibre-fill to ensure a luxurious night’s sleep, not to mention the delicate cotton linens, towels and bathrobes available. 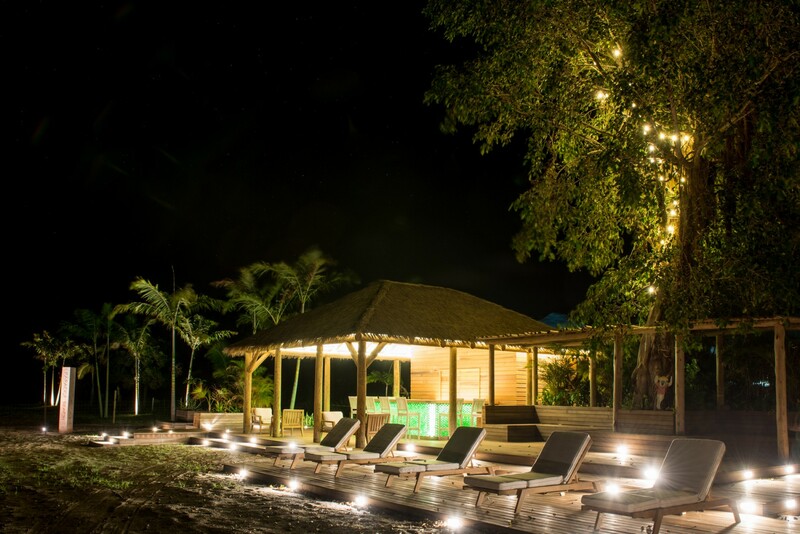 Here is a wonderful private beach bar available to all guests staying at Paradise beach which just steps away from your villa. You can enjoy a continental breakfast four mornings a week. We serve home-baked pastries, bagels, smoothies, fresh local fruit, granola and yoghurt with local Nevis honey. A simple, light lunch menu is also available at the beach bar, offering fresh salads with local ingredients and fresh catch. Menu changes daily so please ask your concierge for menus. 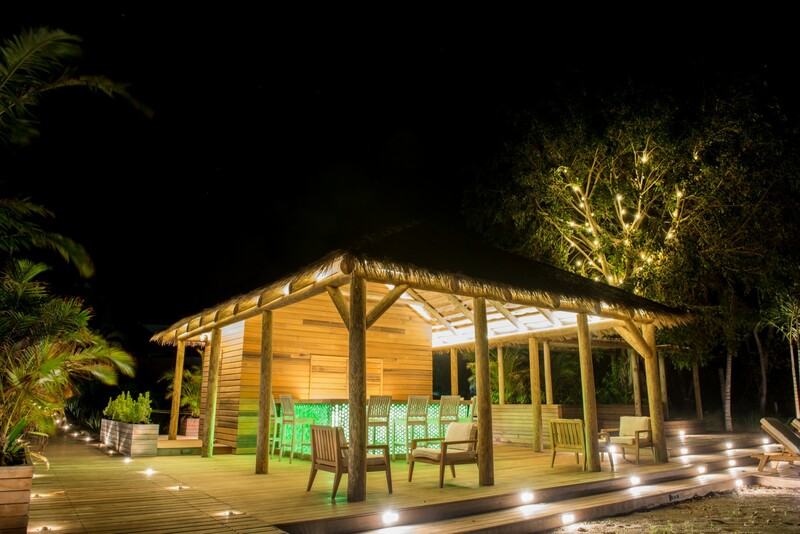 Under the roof of the charming thatched Tiki Bar, delightful island mixologists will tantalise your senses with their speciality island recipes such as Planter’s Spicy Rum Punch. The beach bar is open from 10 am to dusk. Fabulous vacation at Paradise Beach. We had a terrific stay at Paradise Beach Resorts. It lived up to all the accolades we heard about before our arrival. The service was impeccable and the villa perfect for the seven of us. I stay in the Paradise Beach Resort last month and I have an absolutely fantastic time. 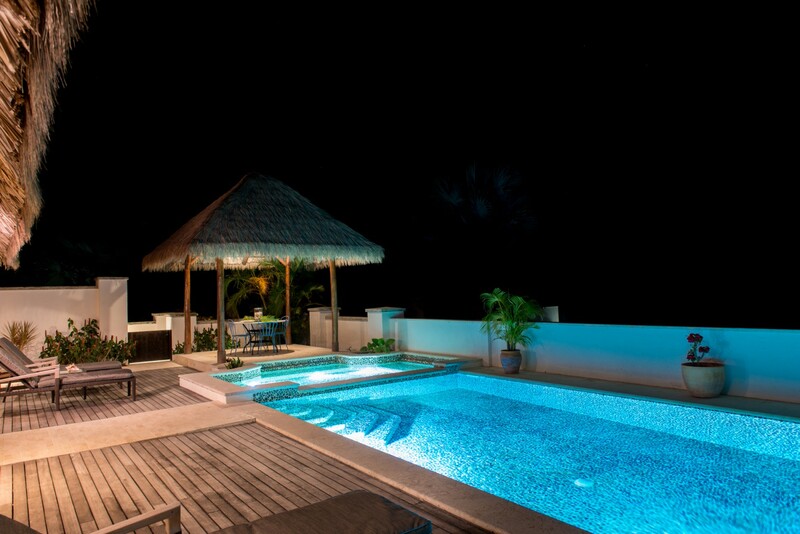 I was lucky enough to stay in the beachfront villa which overlooks the ocean. 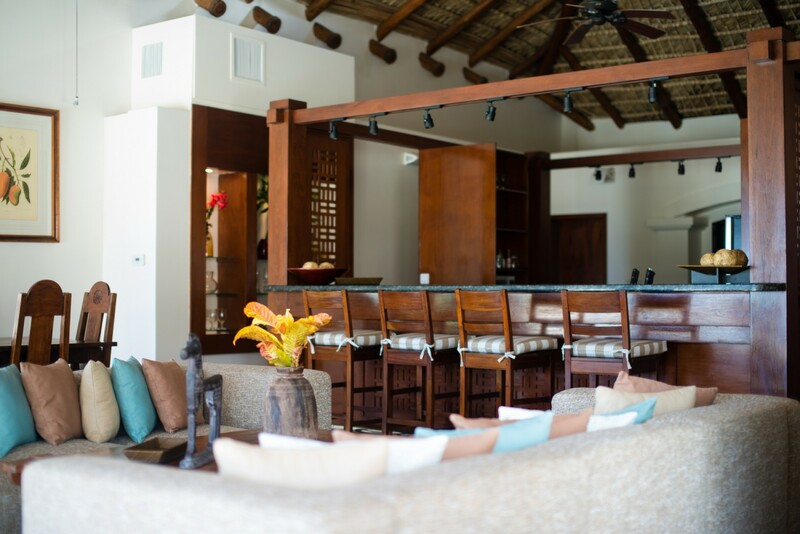 With high vaulted ceilings, thatched roofs it had the look and feel of an Island paradise. 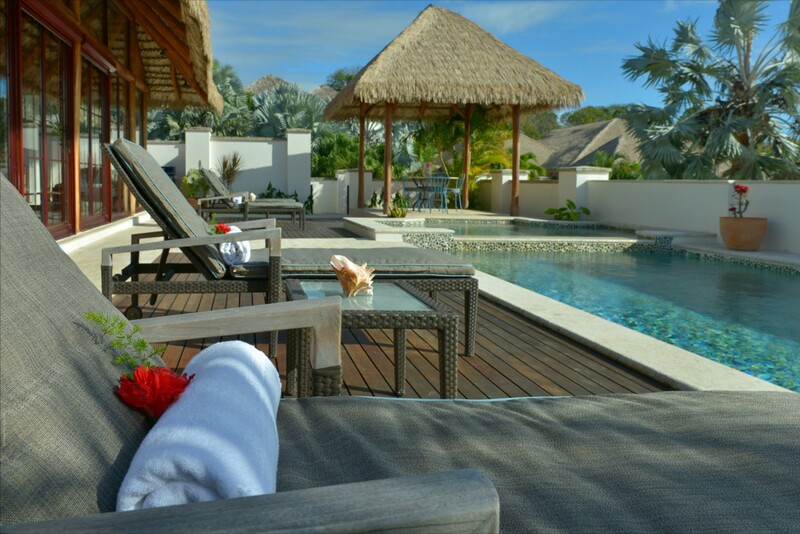 The beds were huge and very comfortable, there is an outdoor shower to invigorate yourself in the morning, thatched cabana for dining by the pool and you are only steps from the white powdered sands of Pinneys beach. On one occasion we hired a chef to come a prepare and cook our dinner. While that was going on, we headed down to the beach bar for some pre-dinner cocktails and watched the sun setting. Dinner was scrumptious and perfectly served by our butler Desi. All in all i had a wonderful experience at Paradise Beach Resort and you will too. One of the most luxurious villas I have ever been too. 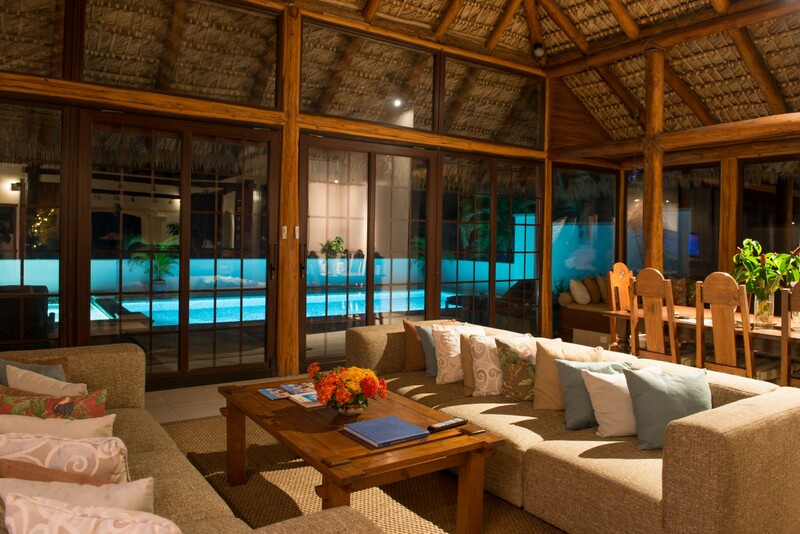 Paradise Beach is one of the most luxurious villas I have ever been too. 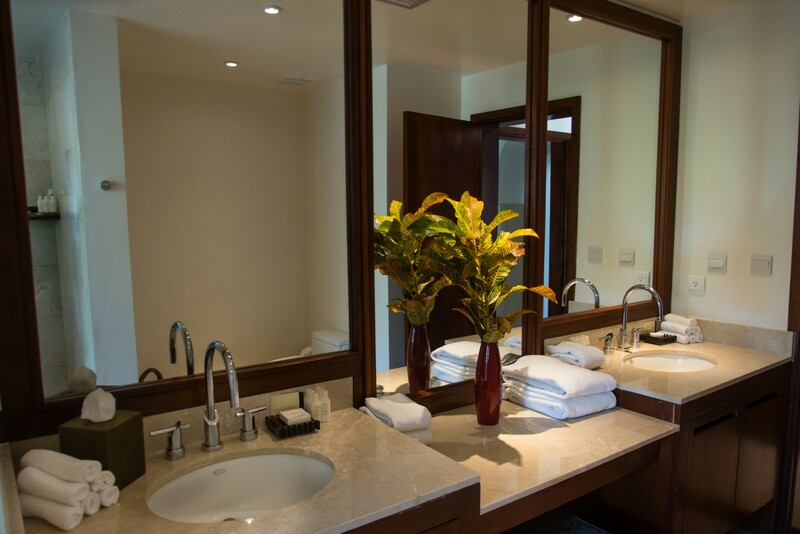 The boutique resort is small and offers personal touches throughout your stay. The beachfront villa where I stayed on a recent visit offered the most amazing views of the ocean and beach. The beach is just steps from the terrace and it is a wonderful place to relax and have a swim. Here you will find a wonderful beach bar to enjoy a cocktail with family and friends, as you can see we enjoyed a drink to two before dinner in our villa. The team at Paradise beach are charming and efficient. Nothing is ever too much trouble. I cannot wait to revisit.